All 22 Episodes of the American television drama following the fortunes of the Ingalls family in the 19th century American west. In this series, Carrie Ingalls's only hope of rescue after she falls into a deep hole is a homeless drunk, Charles has to take on dangerous work to pay for Mary's operation, and the Ingalls and the Edwards strike gold on their Dakota claim. Episodes comprise: 'The Collection', 'Bunny', 'The Race', 'Little Girl.. The year was 1878, the rush for land was on, and among the many who sought a new life in the new land were the Ingalls; Charles, his young wife; Caroline, and their three daughters; Mary, Laura and Carrie. Packing their few belongings into a wagon, they said goodbye to friends and relatives and joined the trek westward that would lead them to their new home in Plum Creek, on the plains of Minnesota. 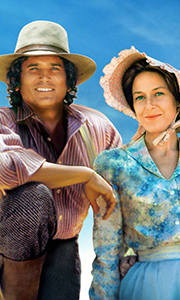 The Ingalls, pursuing the American dr..
Little House On The Prairie debuted on NBC on September 11th, 1974. Based on the best-selling books by Laura Ingalls Wilder, this classic television series was nominated for 17 Emmy Awards and 3 Golden Globes. This dramatic and gripping story of a young pioneer family's struggle to build a new life for themselves on the American Frontier of the 1870's, captured the hearts of viewers around the world. The Complete Second Season - 1975-..
Best known for its life-affirming lessons and heartwarming adventures, "Little House On The Prairie" made its TV debut in 1974 and significantly altered the landscape of television. Loyal fans will relive these exciting and touching adventures, while new viewers will discover the Ingalls’ unconquerable courage to build a new way of life. The series, nominated for 17 Emmy Awards and 3 Golden Globes, has become a TV milestone. The Comple..